Wonder Carpool Service started out in 2014 in Germany. It helps you get your ride to or from work but without the hassle of running for a bus or a local train along with a social experience. You don’t have to spend those lengthy hours in traffic alone ever again. It’s an efficient and convenient means of transport as it not only saves money but fuel as well. Just find someone who’s heading towards the same direction and ride together. Get on the app mention your details, find a neighbor who agrees for the ride and share the fuel charges. And if you have an empty seat, find neighbors who are looking for a ride and take them along. Wunder has started out with a vision that one day sharing a ride will be just like taking a bus together. Presently, it’s available in European cities, Manila, Delhi, Cebu, Bangalore, and Mumbai. If you don’t live in one of those cities don’t worry, it will soon be available in your city too. Get the best offers on Wunder Carpool here at HappySale. Wunder offering up to Rs 200 OFF on first carpool ride by using the code. Offer valid only for the first trip only in Delhi, Mumbai and Bangalore. Wunder reserves the right to suspend any account on suspicions of fraudulent behaviour on the app. Book your ride now! Verified on 22/4/2019 . Wunder offers flat Rs 150 discount on your second carpool bookings. Get this best deal without using any Wunder coupon code. Valid for new and old users. Hurry up! Book now. Verified on 22/4/2019 . Get the best offers on Wunder Carpool here. Win reward points of Rs 100 on every 10 rides. This is a limited period offer. No coupon code required to get this referral offer. Get it now. Use Wunder app and schedule your weekly routine route for your work and get 89% match on rides. This is valid only for Wunder app users. Hurry! Schedule your route now and save more. Verified on 22/4/2019 . Wunder referral reward program is here. Refer as many as you can to Wunder and get Rs 100 to 400 when they ride by using your referral link. Hurry! 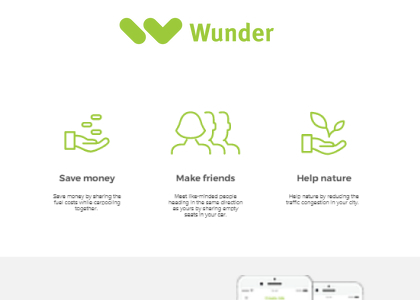 What To Wonder About Wunder? Carpooling is a fun way to commute and meet new people along the way. And if you are an environmentalist you can also reduce traffic and pollution caused by it in your locality and city. With the millennials always worrying about getting late for work. Public transport and no-show cabs that mostly come with surge prices or cancel last minutes aren’t their best bet either. Enter Wunder Carpool Service. If a neighbor has an empty seat in their car and is heading towards the same direction as you are you can connect over the Wunder Carpool app and if they are onboard, then you can get commute together. Just pay for the fuel- no additional or hidden costs. Wunder provides equal opportunities to both the driver and the passenger. How Does Wunder Work? With the Wunder Carpool app you can select the time you leave to and from work. All that is required of you is to enter your details in the app and it will connect you to nearby people who are going the same way as you. If you own a car, all you have to do is register with Wunder Carpool and choose who you want to commute with and is on the Wunder app as well. The drivers have the option to decline requests. If you want to avail Wunder Carpool services on a daily basis, you get a fixed commute price and not have to worry about the price change every day. Wunder Carpool services gives you a built-in chat option for the members to communicate with each other for further clarity. You can pay for the Wunder Carpool services via the various payment modes available. You have the option to pay in cash or link your mobile wallet and make a digital payment. You don’t have to worry about unfair prices or being cheated as the price suggestions are followed in all Wunder Carpool transactions. Wunder Carpool is very safe commute option. The riders can choose their rides after carefully reading all the ratings and reviews of the people they are going to get in the car with. The rating and reviews are available on the profile of the driver and they can accordingly choose their ride. Wunder can be and is used by everyone as it is safe & affordable. You also get to make a friend instead of getting bored in the traffic. The experience you are going to have with the Wunder Carpool services is a safe and fun one. HappySale you the best Wunder Carpool offers, not just the best ones the hottest ones too. These help you save big on every car pool service hailed. So, the next time you’re about to ride with Wunder Carpool, don’t forget to check our amazing discounts and offers.